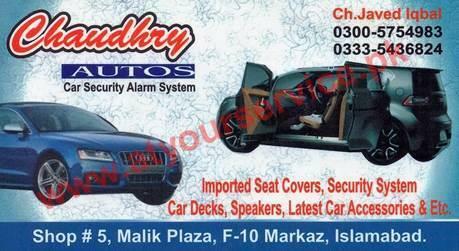 Chaudhry Autos deals in imported seat covers, security systems, car decks, speakers, latest car accessories etc. Chaudhry Autos is located in Malik Plaza, F10 Markaz, Islamabad. It deals in imported seat covers, security systems, car decks, speakers, latest car accessories etc.